It is fairly easy to construct square and rectangle shapes out of the tiny squares and rectangles that you produce on a hand held loom. But what about other shapes? With a little creativity and a little fiberfill stuffing, you can make tiny adorable animals. I spied some adorable softies on the eloomanator blog. A square folded into a triangle and decorated with a ribbon makes little sheep heads! It wouldn’t be hard to convinve me that you can make these look like little teddy bears, too. Head over to Abby’s blog to get a better look at the little chicken that she created. 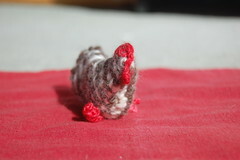 She used a weave-it square woven in a twill pattern and a little bit of crochet to make an adorable Tweed Chicken. What posts do you have to look forward to? Well, weaving with garbage and another cute easy project designed by me are coming up. Would anyone be interested in a few step-by-step weaving pictures to see how the little buggers work? Leave me a comment if you are intersted and I can post that too. Have a project that you want to share? Leave a comment, or email me! 7 Responses to "Woven animals"
Yes, please post some step-by-step weaving pics – that would be great! You have single handedly created a run on weavette\\\\\\\’s, there simply are no 4X4\\\\\\\’s available anywhere! Lucky for me, I have a neighbor that is a weaver, off to find her phone #. Must have the cocktail napkins. Hi! I just got a 2×2 weavette and I can weave the square but I’m confused about doing any other patterns, so if you do step-by-step would you do some on slightly more advanced weaving? I’m a “make it yourself” sort of gal and I’d love to see instruction on making weaving looms instead of purchasing them premade. I already built myself a navajo loom that is attached to a wall. I plan on makin’ a tuffed rug one of these days!! I love all the weaving stuff! I would love to see a step-by-step on how they work. The word is in! I just needed a few takers on the step-by-step photo requests. I wll try to get some well-lit photos this weekend. I’m coming to this party a bit late but I would be interested in all the small loom ideas you have! I have a weavette and love it.